I backed away up tight to the corner of the room in order to get everything in the frame, this is the beauty of having an ultra wide angle lens, there was no way I could have got this angle with the 18mm. The bright orange star Arcturus in Bootes can be seen above the upstairs windows. 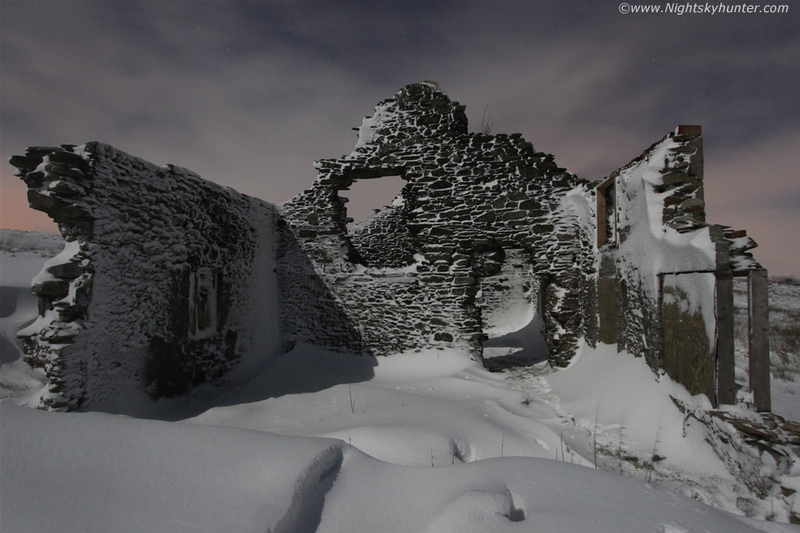 It actually felt a little spooky in here, the bright moon and snow made it look less intimidating than it actually was, wouldn't fancy being in this room on a pitch dark night on my own. Now outside facing the back of the ruins, you can see my foot prints in the snow going through the entrance where the last two images where taken from. The west side of the house which looked across a vast open marshland which climbed to the very top of Glenshane. This snow was pristine and smooth with plenty of evidence that the wind had been harsh here as it sculpted wonderful forms and patterns across the snowscape. 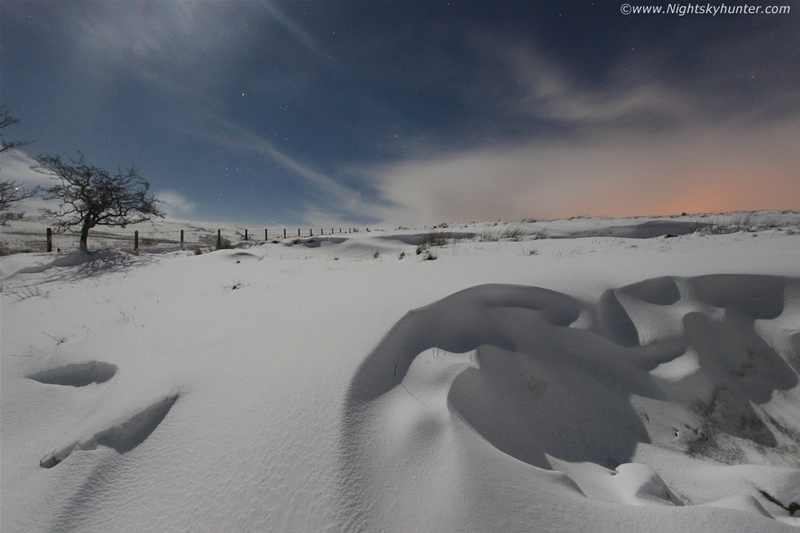 This is a big snow drift with Orion and Taurus visible over the moonlit snow. It may look calm and serene in the images however it was quite brutal when these images were taken, it was cold with a terrible wind chill which began to penetrate through our clothes and my back and feet were getting damp and chilled from standing in the deep snow for so long. My fingers were killing me with the cold and felt sore and starting to go numb and the breeze which swept down the mountain was accompanied by tiny ice crystals which were blown through the air into my face which felt sharp like icy grit, many of these ice crystals whacked into the lens which caused blobs and a mottled texture to the sky. 01.00 UT. 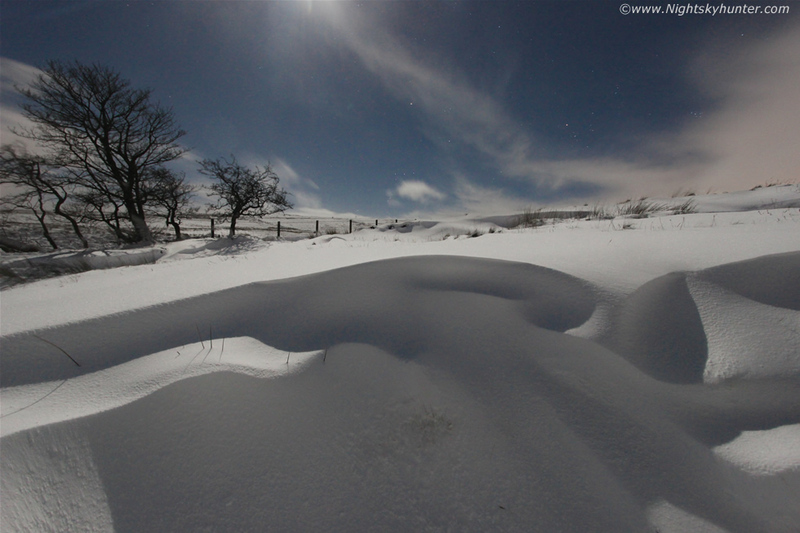 Standing inside a 5ft deep snow drift with stars, this the first time I had ever photographed a deep snow drift in moonlight so that's a new tick off my list, standing inside it was amazing, again it was shocking to see this as the forecast predicted a maximum of 6" on the hills, not 5ft!. Paul and I then met up again, took a few more exposures together then retreated to the comfort of the car to get warmed up as the exposure on the mountain was starting to get to us, however it was worth it, we were delighted by the scene and the experience turned the night into a complete success so if we captured anything else tonight then it would simply be the icing on the cake. 04.00 UT. This had already turned into an all-night session. We spent some time admiring the stunning snow-covered trees on the hill outside Maghera near the Glynns, there was 4" of snow on the tree branches and up to 6" of the stuff on the larger branches, needless to say the branches were sagging under the weight and looked spectacular in the glow of the street lamps as more snow began to fall, this time the gentle magical kind in the form of big soft flakes which reminded me of Christmases past, it was so silent we could hear each flake come to rest on the blanket of snow covering the ground. A temperature difference between inside the car and outside caused my camera's sensor to fog over when I changed lenses so during this period I got no images of the trees however I did get several video clips. After 30 min's of waiting for the camera to climatise I decided not to waste any more time and just give it a blast with the warm air from the car and after several min's the fog cleared and my sensor was back to pristine again. 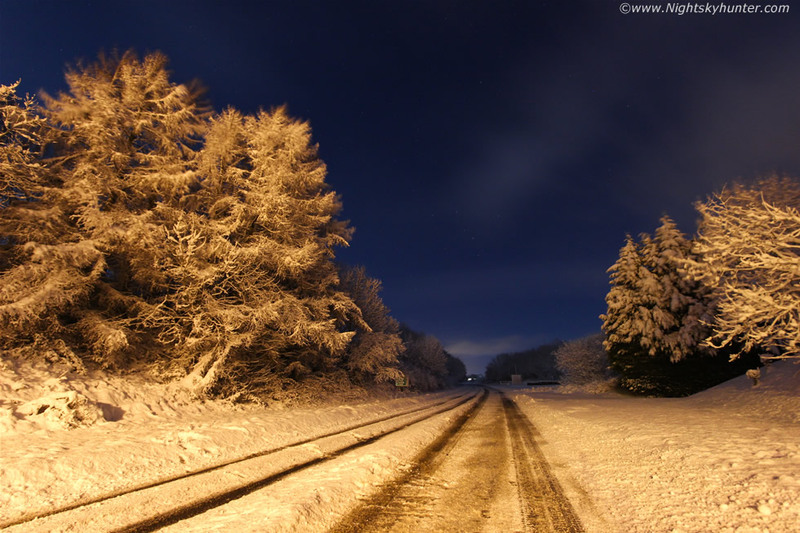 Our next stop was on the Coleraine Road itself which looked stunning with thick snow on the ground lit into warm colours by streetlights which contrasted beautifully with the blue moonlit sky and stars. This was taken from the middle of the road facing north towards Swatragh. Taken from further up the road facing back south towards Maghera. 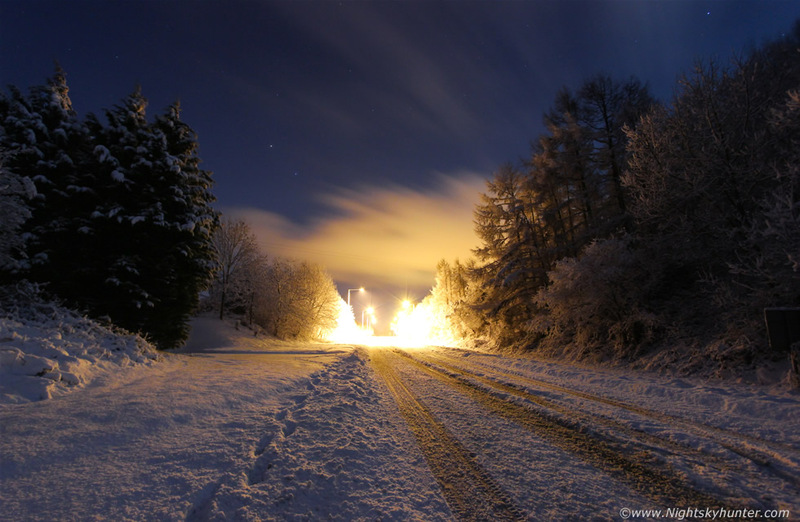 Normally this is a busy thriving road so to be standing out in the middle of it at 4am deep in snow was simply breathtaking, it looked like Narnia with warm and cold colours, snow-covered trees, and stars aloft while the moon began lowering towards the west behind the trees to my right. 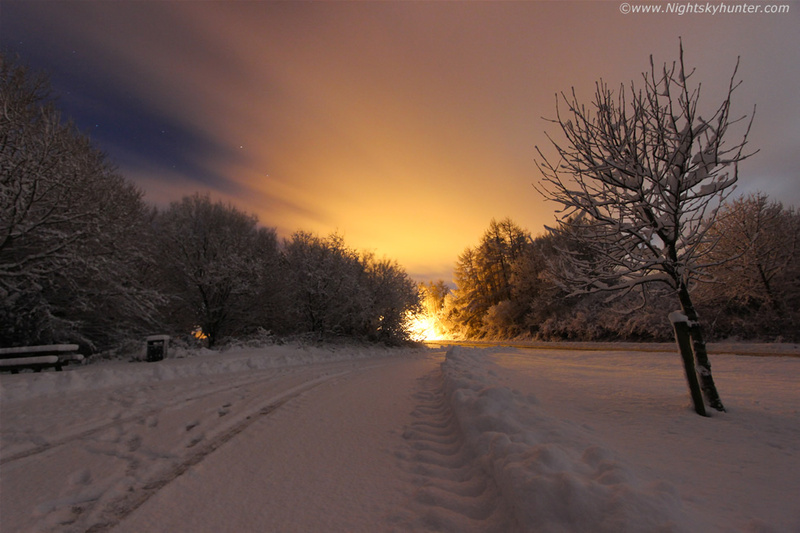 I hadn't seen this much laying snow at ground level here for a long time so to be able to photograph this at night in my own home area was a very special memory. Pic nic area opposite the Grillagh River. 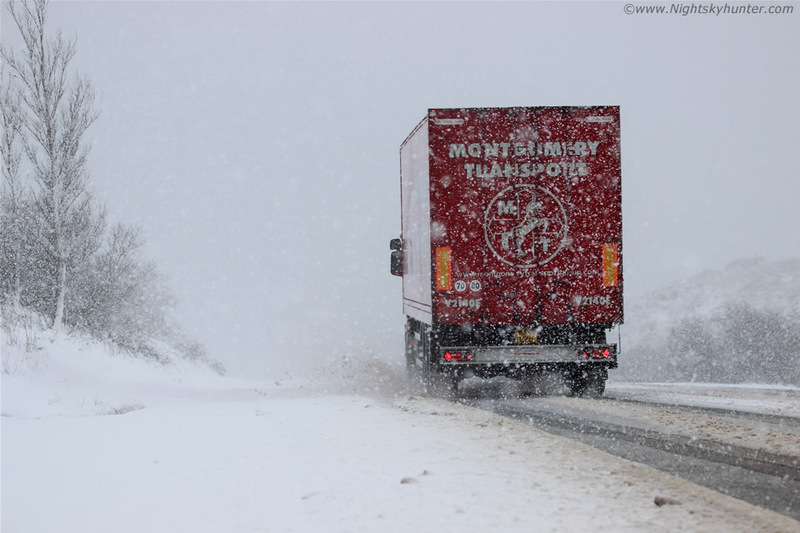 The only other traffic on the road was from a gritter who passed us several times, he got so used to seeing us that he beeped the horn and gave us a wave. 04.45 UT. We ended up back where he had started this shoot at Swatragh Church, hard to believe that it was the previous evening we had been here at dusk and now here we where again before dawn. We had lost the moon and stars behind cloud so we spent the rest of the night shooting here anyway because the old Church was simply beautiful and so were the grounds upon where it rested. 10mm exposure at the entrance, at a glance you can see the tree to the right leaning over due to the weight of the snow. Paul and I entered the grounds silently, the only sound was from the opening and closing of shutters, then as if an unspoken word was whispered we parted company and blended into the night like a special forces unit. 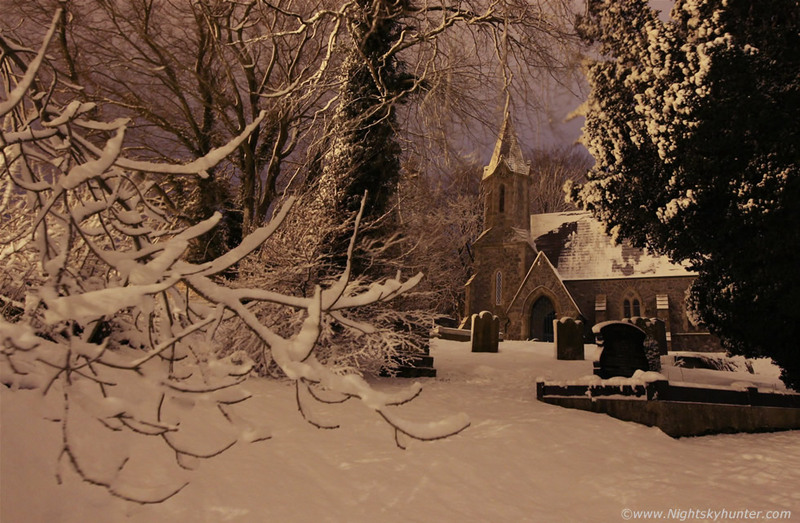 I went into another world of my own as my adventure began through the snow-covered graveyard. Up close and personal with the head stones at ultra wide angle. 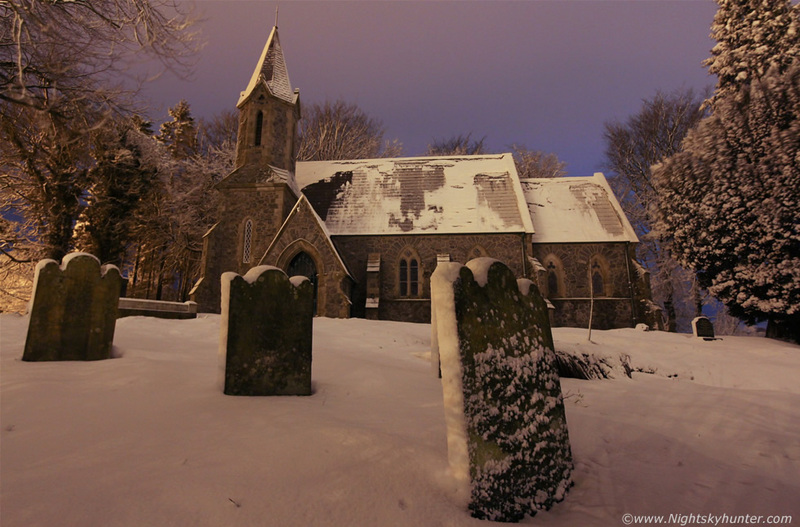 It was silent here, the only sound was the occasional breeze stirring the trees which you can see in the exposures as motion blur then every now and then there would be a shuffling sound and a dull thumping noise caused by slabs of snow sliding off the Church roof and hitting the ground. 05.00 UT. It really is a beautiful church isn't it. You can see the sections on the roof where the snow had slide off. If you go back to page one of this report and check the second image down you will see this exact same scene, it amazes me to think it was taken during the same shoot eleven and a half hours ago, that seems like a dream. 05.20 UT. 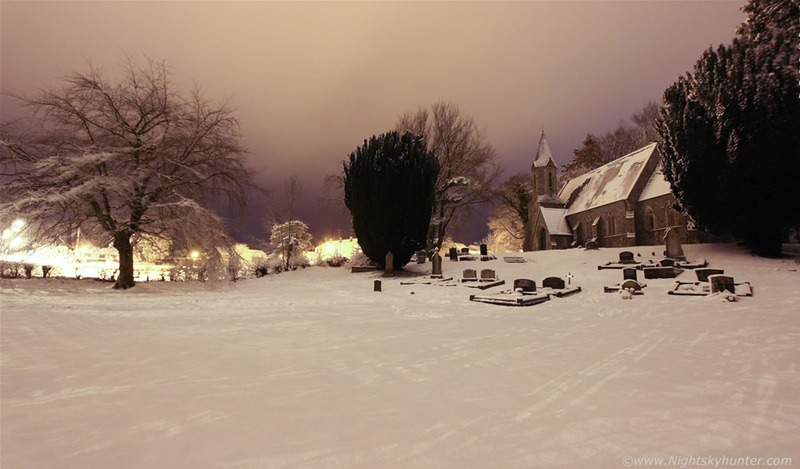 Pano style of the entire scene taken from the corner of the graveyard with my back against tall trees with huge curving branches of snow above me. 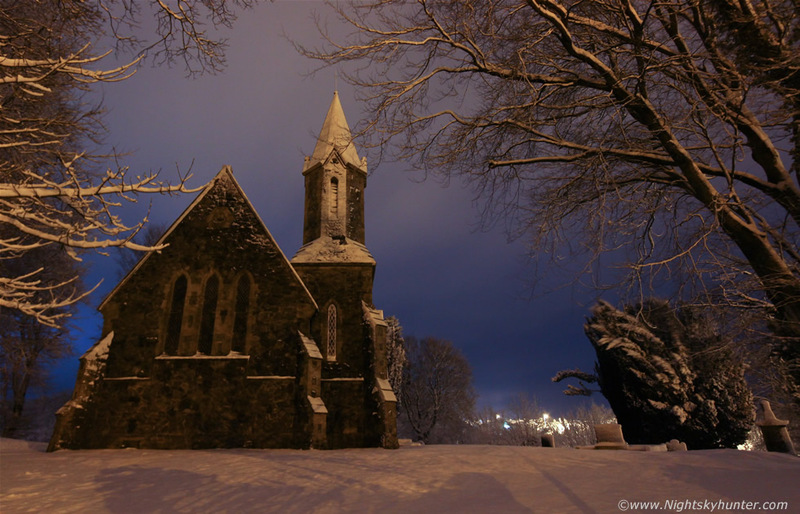 My last exposure of the night showing the church with the snow accumulations on the branches for foreground interest. I met up with Paul again and we decided to call it a night, the constant shooting in the snow had got to us, we felt exhausted, cold, dry and drained however we did the very best we could. Paul jokingly talked about hanging around to shoot the sunrise over snow then we both burst out laughing - not because there was no chance of that happening due to us being tired - but because had it been clear we more than likely would have been watching the sun rise from Glenshane Pass - and that's a certainty, although I think both of us were glad it was overcast so we could end the shoot with justification. I was home for 06.00 and not in bed until after 07.00 so that makes a non stop 13 hour photo shoot out in the Winter weather, what a magical night it was and a roaring success. The next day, Feb 13th, I was up Glenshane Pass yet again, this time during the afternoon rush hour when heavy snow showers hit the mountain hard causing traffic to take it easy with tail backs and cars and lorries loosing traction as near white-out conditions formed for a period, I just about got away with getting parked on the shoulder to get a few telephoto shoots and no more, I came close to getting stuck and once I made it out I stayed out and made it back to lower ground, I love the snow on this mountain, it never disappoints. The effects of our all-night photo shoot would last for several days more. 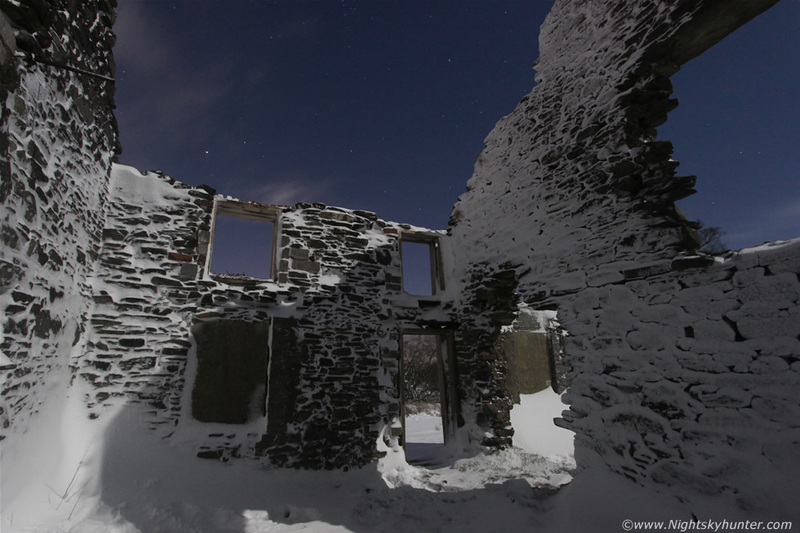 My image of the derelict house in moonlit snow was kindly featured in the Belfast Newspaper on Feb 13th however a couple of days later on Feb 15th I got a surprise email from the Telegraph's image editor Peter Prainey informing me to get today's paper because there was a cartoon in it about me, I was somewhat puzzled by this so I went out and purchased the paper and when I did I got a delightful shock. 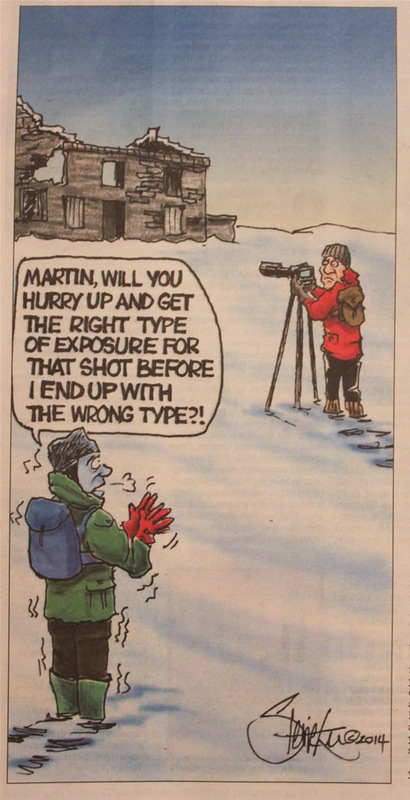 There was a cartoon featuring Paul Martin and I out in the snow doing photography in reference to our big photo shoot complete with derelict house!, I couldn't believe it, the exposure joke was rather humorous and it felt good to have a laugh at ourselves and at the kind of things we get up to. I have never been featured in a cartoon before in my life so this was quite a novelty and one for the records so thanks for the 'exposure' Peter!. 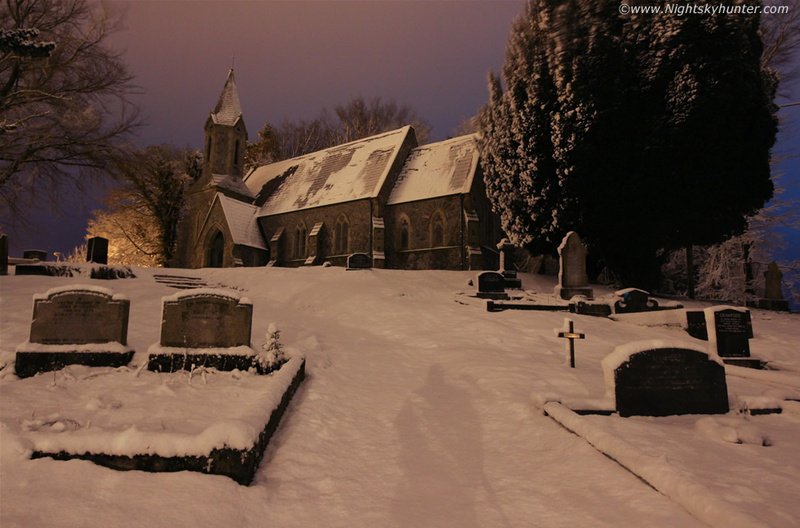 Video clip featuring various scenes during the course of the night including Swatragh Church at dusk, Dungiven town night snow, Glenshane Pass blowing snow at night and Maghera street light illuminated snow during the early hours of the morning, best to watch in HD for best quality. I hope you enjoyed the report, thanks very much for reading.